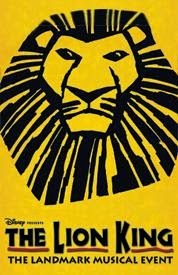 Still haven't seen The Lion King on Broadway? Well there is no better time than right now theatre fans. Or should I say Disney fans. It is based on a Disney film after all. But of course you knew that didn't you? Based on the hit 1994 film of the same name The Lion King is one of the most unbelievable experiences that you will ever have in the theatre. It is incredible. Now obviously I am not the only one who thinks that because The Lion King has made over a billion dollars since it first opened on Broadway in 1997. That is the most in Broadway history just in case you didn't know. Now I'm sure that most of you who have seen the show or are going to see the show are doing so because you've seen the movie right? Makes sense to me. But what if you know nothing about the show? Well you are in luck. Here is a little synopsis of The Lion King for you to check out before you see it. Enjoy! Born into the royal family, precocious cub Simba spends his days exploring the sprawling savanna grasslands and idolizing his kingly father, Mufasa, while youthfully shirking the responsibility his position in life requires. When an unthinkable tragedy, orchestrated by Simba’s wicked uncle, Scar, takes his father’s life, Simba flees the Pride Lands, leaving his loss and the life he knew behind. Eventually companioned by two hilarious and unlikely friends, Simba starts anew. But when weight of responsibility and a desperate plea from the now ravaged Pride Lands come to find the adult prince, Simba must take on a formidable enemy, and fulfill his destiny to be king. Now that sounds like a show I want to see. Well see again I should say. By the way for those of you who still haven't seen it you have come to the right place my friends. We sell tickets to The Lion King. In fact we sell tickets to every show on Broadway. It doesn't get any better than that. Just give us a call and see the show that won six 1998 Tony Awards including Best Musical of the Year. Get your tickets to see The Lion King on Broadway. You will love it. Until next time theatre fans.